The park is not a regular stop on the soup run, but our hosts felt the need to stop there that night. This is the same park that we took the residents of Hermano Padro to during the day, pushing them in wheelchairs and letting them feel the sun on their faces. At night the park is a different story. In Antigua, the homeless are not allowed on the streets or parks during the day. But after 8:00 pm, as previously stated, they are allowed to roam and sit freely. As usual, one person jumped out of the van and counted how many meals were needed. At this stop only three were required. We met a woman in her sixties, who had been on the streets since her twenties. She suffered epilepsy, and there wasn’t any medical assistance she could afford. She had made a life on the streets for the last 40 years! The other two men that we met at this stop, gratefully accepted the rice and tortilla. But shortly after one of the men started eating, we noticed something was wrong. His hands started to shake uncontrollably. One of the students, Seth, sat down beside Daniel and tried to help him eat. Eventually it was evident that he wouldn’t be able to eat. He couldn’t even swallow what was in his mouth. The guy beside him told us that he was in withdrawal and just needed a bottle. “Could we get one for him?”. No, no we couldn’t. “Could we at least get a cloth with alcohol on it for him to smell? That would help.” No, no we couldn’t. As Daniel’s whole body started to spasm, Seth and I held him. Most of my focus was on Seth. Was he OK? Did he have the strength to deal with this? Was this too much for him to handle? Amazingly, Seth showed strength beyond his 18 years. It was only the three of us with God in that moment. As Daniel shook, holding his stomach and saying in Spanish over and over “Help me! Help me! Help me!”, we held on. What we didn’t realize was the chaos that was going on around us. Our host had assessed the situation, and made the call that Daniel needed medical assistance. He went to get the Bomberos, a free paramedic service in Antigua. While waiting for the Bomberos, the police showed up, a fire truck and along with tons of tourists. I had no idea. My focus was on Seth, Daniel and our group. There were many tears, and people were overwhelmed. Through it all, Seth and I held on to Daniel. I have no idea how much time had passed. At one point, this man showed up, sat Daniel up, took off his shoes and began hitting his feet!! When that didn’t work, he walked away. It was the strangest thing ever. He was obviously a man of the street, that knew how to try to revive a person in withdrawal. Eventually the paramedics came. They picked Daniel up, put him on a stretcher and off they went to the hospital. Unfortunately, we never heard what happened to Daniel. Our hosts had kept an eye out on the street for him. Our hope is that he got the help that he needed. After Daniel was taken away, another surprising incident occurred. During the whole episode with Daniel, the gentleman that was beside him had been asking many questions. He talked to our host about why we were there from Canada and what we were doing? Then he started asking about God and Jesus. Shortly after Daniel was driven away, the man wanted to accept Jesus as his Lord and Saviour. Our whole group gathered around him and prayed. It was an incredibly powerful moment. The van ride back to the base was quiet. Everyone was occupied with their own thoughts. I talked to the other leader, and let her know that we were on our way and would need time to debrief. The other students were in bed by the time we got back. Debriefing after such an experience is essential. We talked about it, we cried and we prayed. One of the staff members of YWAM, said that he had never seen such a strong, compassionate, caring group before. He said it through his tears. Once I heard about how many tourist had gathered, I realized that seven years ago, I would have been one of those tourists looking on from the outside. As a result of my life change, I was at the centre instead. Amazing. 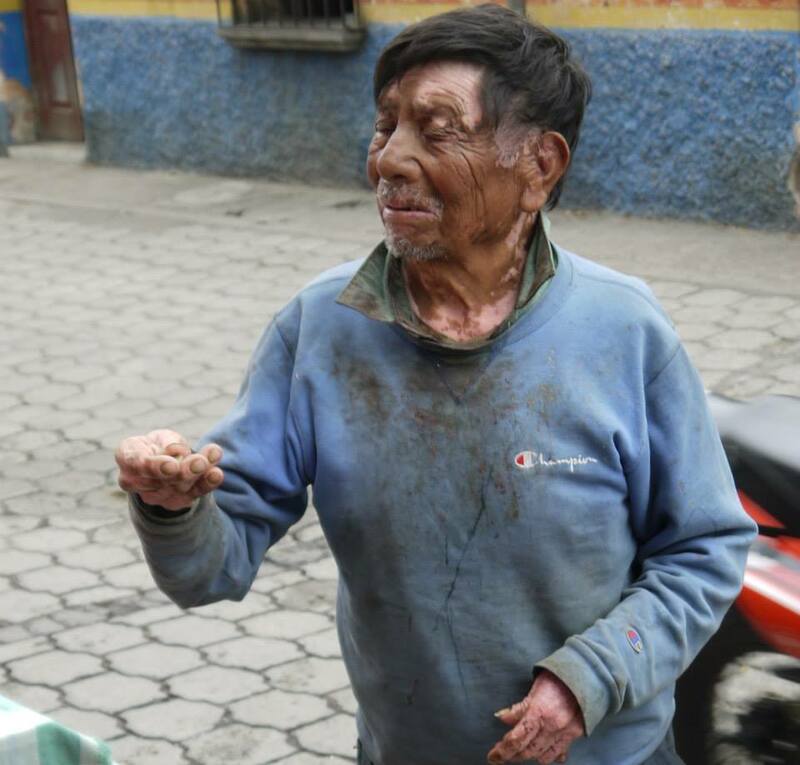 So, what lessons did I learn from a homeless man on the streets in Guatemala? I learned that God is in the streets of Antigua. He is everywhere. There is no way that Seth and I could have had the strength and courage to do what we did without God’s protective arms around us in that moment. I learned that it doesn’t matter what age you are, you can change the world…. one person at a time. I learned that when God calls you to do something, do it – no matter how uncomfortable it is. I learned that building relationships changes people. (The soup runs have resulted in men being admitted to rehab centres, returning clean and volunteering in the men’s homeless cafe. To us it may just be a cup of soup, but to them it could be a change in life). I learned that short term mission trips change the lives of those that go, but also the lives of those they serve. I learned I am stronger than I give myself credit. I learned life change happens when you allow God in. Thank you for teaching me all that Daniel, (wherever you are).